Giving thanks is a mark of character and good manners. Feeling thankful is merely an emotion, coming and going at your whim; in distinction, giving thanks is a deliberate choice and specific action. 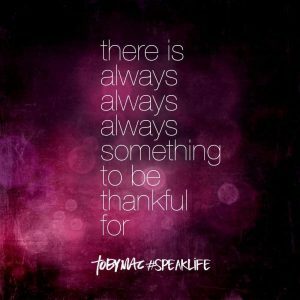 Giving thanks is not always easy, but it is always possible. Thanksgiving is the lifestyle of the person who recognizes and honors God as their Source. The Psalmist wrote, “Enter His gates with thanksgiving and His courts with praise; give thanks to Him and praise His name. For the Lord is good and His love endures forever; His faithfulness continues through all generations.” Psalm 100:4-5 NIV. Never mistake that as optional; it is recognition due the Author of all that is good. It is true that, “Every good and perfect gift is from above . . from the Father.” James 1:17 NIV. Every good thing that you receive finds its source in God. Giving thanks is a mark of character and good manners. As Paul reminded the Christians in Corinth, “What do you have that you did not receive? And if you did receive it, why do you boast as though you did not?” 1 Corinthians 4:7 NIV. Self-sufficiency is a myth. This is the plain and simple fact, “My God shall supply all your need according to His riches in glory by Christ Jesus.” Philippians 4:19-20 NKJV. Should you and I not rejoice and give thanks for such a promise? “Giving thanks always for all things to God the Father in the name of our Lord Jesus Christ.” Ephesians 5:20 NKJV. From this verse, I see several practical truths regarding the matter we are considering today. Give thanks to God. Give thanks always, without exception. Give thanks for all things, without exclusion. There is something I have observed. Facts do not follow feelings; feeling follow facts. The fact is: God has been gracious and generous always, in all ways, and to all people. “Therefore, by Him, let us continually offer the sacrifice of praise to God, that is, the fruit of our lips, giving thanks to His name.” Hebrews 13:15-16 NKJV. Note the order. “The sacrifice of praise,” precedes then results in, “giving thanks to His name.” God would not leave such an elemental truth at the mercy of emotions. People wrongly assume that a person should not give thanks without feeling thankful. Knowing the releasing power of thankfulness and gratitude, the enemy of your soul will use such inaccurate reasoning to discourage then excuse you from being thankful. Many times, you may only feel thankful after you are obedient to be thankful. Feeling thankful is elusive; being thankful is obedience. Today, I pray for you to be faithful in thankfulness to God and others for grace. Like a window, a good story lets light shine into darkness. God loves people, all people. As a Mom loves her ailing child who needs comfort and healing, God especially loves lost people. Here is how much God loves lost people. “God demonstrates His own love for us in this: while we were still sinners, Christ died for us.” Romans 5:8 NIV. His love is all sourced in grace, unmerited favor, with no qualifying effort or goodness of your own. “And if by grace, then it is no longer by works; if it were [by works], grace would no longer be grace.” Romans 11:6 NIV. Read Ephesians 2:8-9 NKJV. The Apostle Paul was absolutely secure in his knowledge of the limitless extent of God’s love, “For I am convinced that neither death nor life, neither angels nor demons, neither the present nor the future, nor any powers, neither height nor depth, nor anything else in all creation, will be able to separate us from the love of God that is in Christ Jesus our Lord.” Romans 8:38-39 NIV. Nothing but your own decision can separate you from the love of God. Such a decision would be tragic. The Bible’s theme is about redemption, the joyful recovery of what was lost. Everyone likes a good story and Jesus was the best story teller of all. Like a window, a story lets light shine into darkness. Jesus told common, everyday stories to illustrate grand, eternal truths. Usually, His stories began or ended with the words, “In the same way, the Kingdom of Heaven is like . .” The intent of Jesus’ stories was to illustrate His Kingdom. One of Jesus’ stories, and probably the most familiar and beloved, is all about lost things. Jesus told about a lost sheep, a lost coin, two lost sons, and a grieving father. Read Luke 15:3-31 NIV. The sheep simply wandered away from the shepherd and became lost by no intent of its own. Yet was found because a shepherd cared enough to search for one lost sheep. And then, there was rejoicing that what was lost had been found. A coin was lost because it was unintentionally misplaced and forgotten, until its owner was unwilling for the coin to remain lost, searching relentlessly until she found it again. And again, there was rejoicing when what was lost was found. “For God SO loved the world that He gave His one and only Son, that whoever believes in Him shall not perish but have eternal life.” John 3:16 NIV. When words failed John to explain God’s lavish love, he used a very small adverb, “so,” which well described the indescribable – the dimensions of how much God loves a lost world. “How great is the love the Father has lavished on us, that we should be called children of God! And that is what we are!” 1 John 3:1 NIV. That is what we are – children of God. Today, I pray for you to allow no distance between your heart and your Father. 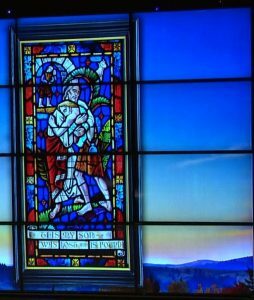 A SPECIAL NOTE – In the title below, I have included a Link to a recent video teaching, “The Difference Between Lost and Found.” My thoughts expand today’s topic as I recently shared at the Cathedral of Faith, San Jose, CA. The Father’s love is the difference between lost and found. As an extra treat, my friend and singer, Lillie Knauls, shares a classic hymn, Amazing Grace, as introduction to my teaching. Enjoy . . The noisiness of your surroundings and the busyness of your schedule will impair your ability to hear the still small voice of God. “The Lord said to Elijah, ‘Go out and stand on the mountain in the presence of the Lord, for the Lord is about to pass by.’ Then a great and powerful wind tore the mountains apart and shattered the rocks before the Lord, but the Lord was not in the wind. After the wind there was an earthquake, but the Lord was not in the earthquake. After the earthquake came a fire, but the Lord was not in the fire. And after the fire came a gentle whisper. When Elijah heard it, he pulled his cloak over his face and went out and stood at the mouth of the cave. Then a Voice said to him, ‘What are you doing here, Elijah?’” 1 Kings 19:11-13 (NIV). Only then did the Lord commission Elijah to anoint a king over Syria, a king over Israel, and to anoint Elisha as a prophet in Israel. God has a purpose for your life and you will only discover His purpose when you make time and priority to listening for the voice of God, and obeying what He says. God can and will speak whenever He chooses, and whatever your circumstance, and wherever you may be. You and I have to come to a place where we can and will best listen for His voice. God’s admonition remains, “Be still and know that I am God . . In quietness and confidence shall be your strength.” Draw aside and alone, and listen with your heart. You will hear God and know His voice. 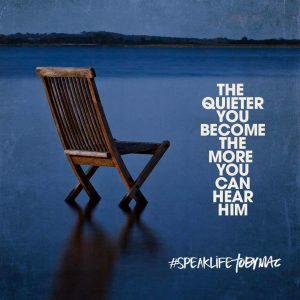 I pray for you to draw aside today to be alone and attentive before God where you will quiet your heart to listen. God has the answers you seek. He has the wisdom you need. He has the direction you lack. Tears and hope are complementary, not contradictory. “Through the patience and comfort of the Scriptures we have hope.” Romans 15:4 NKJV. Have you ever had nothing to hold onto except hope in a distressing situation? For too many that seems to be the rule rather than the exception. When hope rests solidly on the Word of God and your faith in that, hope is sure and steadfast. Last week was challenging. I last wrote to you about a steadfast hope that we have in Christ. Little did I know that the same morning I would receive a call that our grandson Parker, just twenty-one years old, had died in an automobile accident. The news was devastating. Yet the words about “Steadfast Hope” were tried and proven true. God has been faithful and His Word is ever sure. The Blessed Hope of which Paul wrote is nearer and dearer than ever before. Our family is grateful for the loving words of encouragement and faithful prayers of so many friends, the ministry of our church, our faith in Christ and His Word, and the grace and faithfulness of God has sustained us these past days. Rather than writing last week, I set aside time to be with our family as we grieved together and began the healing process. Our family has grieved individually and collectively because of this tragedy. Pain has been our companion and part of our conversations these recent days. And I believe that God has grieved with us over the death of Parker – our grandson, son, brother, uncle, nephew, cousin, and friend. We are a family of faith. We do not grieve apart from hope; we do not hope apart from Christ. As Paul wrote confidently, “I want you to know what will happen to the Christians who have died so you will not be full of sorrow like people who have no hope. For since we believe that Jesus died and was raised to life again, we also believe that when Jesus comes, God will bring back with Jesus all the Christians who have died.” 1 Thessalonians 4:13-14 NLT. We sorrow, but with the sure hope of the believers’ resurrection. Read Titus 2:12-13 KJV. As we stood beside our grandson’s body in the ER and trauma center, weeping and trying not to do so, the grief and sorrow felt unbearable, the tears uncontrollable. Saying a final good bye to a grandson is something I never expected to do, yet my pain does not compare with the pain of my son and his wife saying a tearful farewell to their young son. In those moments, I believe the Holy Spirit comforted my heart with this thought, “Tears are often the voice of prayers spoken from the heart.” I certainly have discovered that tears are the language of the heart. Tears communicate a depth of emotions that words often do not. Tears release pain in ways language cannot. Tears and hope are complementary, not contradictory. Read 1 Peter 1:3-5 NIV. A personal note: I would appreciate your prayers as we minister in four services this Saturday evening and Sunday morning at Cathedral of Faith, 2315 Canoas Garden Ave, San Jose, California, with Pastor Ken Foreman. The teaching will also be Live Streaming on their Online Campus, Sunday, 10 AM, West Coast time. Go to: http://cathedraloffaith.org/live?parentnavigationid=25879, Online Campus. Due to travel and ministry responsibilities, I may not be publishing EDL until my return home . . Blessings!